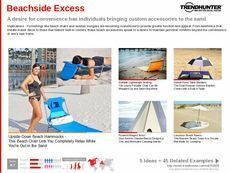 Find Better Ideas, Faster ® with a custom beachwear trend report, our PRO Dashboard and 80+ categories of premium trend reports. The Beachwear Trend Report outlines the fashion apparel that is associated with swimming or lounging on the beach in summer. Bathing suits for men and women are discussed, with the prevalence in trends like bikinis, one-pieces and Speedos explained. Sun hat and baseball cap designs are discussed, as well as sunglasses. Finally, beach accessories like beach bags, sandals and even tents or towels are touched upon. Useful for fashion retailers, this report will help designers and display organizers understand summer trends and patterns in swimwear. Swimsuit, sunglasses and hat designers will gain inspiration, while magazine editors and photographers can gain an understanding of what's to come in consumer interest in beachwear. The Beachwear Trend Report sifts through the many designs for men and women for summertime that allows them to stay fashionable while providing functionality during water play or beach lounging.